Posted on September 3, 2010 by Shana N.
This has been a strange but inviting week. I’ve been spending time job searching between fun and interesting time with friends. Honey smiles after her first trip to a dog park! 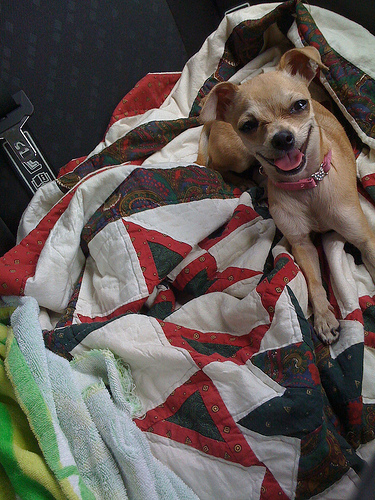 I got huge smiles and lots of naptime after I met up with my girlfriend Heather for her day off and we took our dogs to a nearby dog park. It was a great way to get Honey used to an off leash area with NO other dogs except her buddy Benny. She is cool with him and they had the park to themselves to run in. It had been raining the day before, so I took a graceful slide in mud and Honey fell IN, yes completely IN a deep puddle. It was all quite funny. We went to Starbucks afterward for coffee for me, water for Heather and a doggie latte for our pooches…(whip cream in a kiddie cup). Heather spoiling me rotten with good foods! That same gorgeous Monday we went back to Heather’s apartment for lunch where she proceeded to make green salsa, and Beef Chile Colorado which we had in tortillas with black beans. 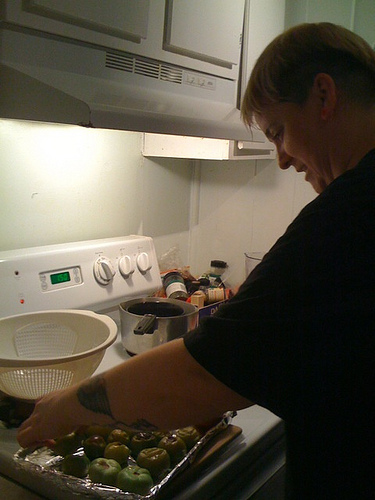 Get this….this wonderfully talented woman even sent me home with canned left over sauces. *psst* The Green salsa is gone and so is the walnut blue cheese bread you sent home with me. SOOOO yum! I love days of indulgence. 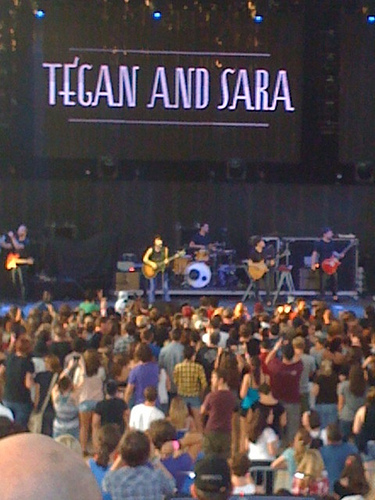 The Tegan and Sara show last night was wonderful. They played all of the songs I longed to hear in concert, they were adorable and quirky and the show was great! I got a ride down with a new friend with whom she and I keep finding things in common, she was taking her daughter down for her birthday since the big name band playing was Paramore. It was tweens everywhere. Terrell was racing the clock, he got off work at 6:15 and showed up at the show in the middle of Tegan and Sara’s first song. It was the best timing and we had such a good time! * Coffee with Ethan * Dinner in the rain with my husband * Late night talks * making amends * reading in the sunlight * Searching for a job on a quilt in my backyard while Honey plays and chases dragonflies * The dozen or so butterflies that have crossed my path this week! * This song makes me want to dream a little more and smile a lot more. * My first pair of TOMS shoes were bought with birthday money (I saved gift cards and had almost forgotten about them!) * My husband singing songs but changing the words to fit his life, singing about me and the puppy….it really makes me fall in love with him a little more every time he does this. * Finding out carrot dogs still exist and planning to eat one Saturday! * Three day weekends with my happy little family! and winning tickets for MMA for my man thanks to twitter re-tweets! Happy 35th Anniversary to my parents! Posted on August 31, 2010 by Shana N.
I love Bjork and this cover in her honor is so GOOD! Posted on August 28, 2009 by Shana N.
* My Knight in shining armor! I had a terrible week last week that ended up draining my already hurting bank account and sitting on the side of the road with a flat tire, no lug nut bar to remove said tire and hives (I had just come from the Dr.) I called my husband and not only did he come running….but we ended up having to tow the car and he took me home while we were waiting on the tow truck and let me stay cool in the AC while he dealt with that mess! Also came home with the meds my Dr. prescribed for the hives. He is my hero and I told him so many times!!!! * Breakfast for dinner. This week I wanted breakfast for dinner. It’s such a guilty pleasure but we went to Village Inn and had crepes filled with yumminess and covered in fresh fruit. Delicious! *Bat For Lashes! Her sophomore album feels like mellow magic. 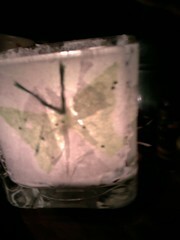 It feels like fairies are dancing in my ipod. I want to light candles put feathers in my hair and let her read my fortune. Her songs are these beautiful descriptions of life. *Craft night has been small lately and it has been a lot of fun to get to know all the ladies a little better. Plus I have come home with a cute votive holder and also swanky cool greeting cards to send to friends! *Working with people that I like. I eat lunch with them and we end up having these conversations that result in belly laughs and sometimes tears. Those laughs are seriously so good for the soul. I feel lucky to be where I am even if it is only for a one year contract. Quick mentions: candle light, vampire playlists, book club meeting, new tires & perfect alignment, true blood episodes that rock (Oh Eric! ), cool gel benadryl (makes the hives stop itching like a charm), feather necklaces, Project Runway (finally! Season 5 on Lifetime), Riverside Arts Market, Birthday parties with jello shots, safely driving home drunk friends that yell funny stories from the backseat, Meeting people that wear shirts that say “Construction Worker by day, Ninja by night” and having them be as funny as their shirt! 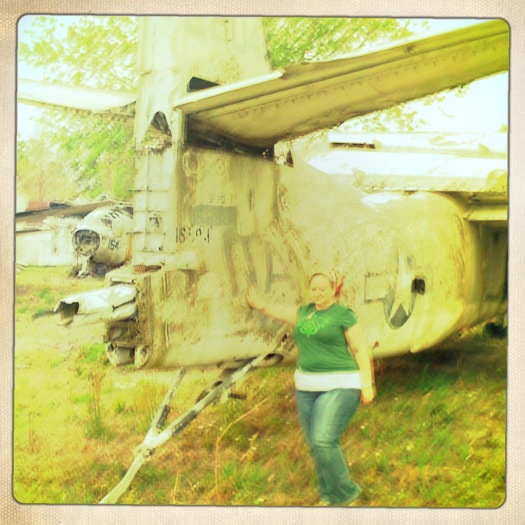 Posted on August 11, 2009 by Shana N.
I’m going to expand out since my beats and books categories aren’t being posted to as often as I’d like. Life has just thrown a little curve and my book reading has declined a little (although I do have a book that I will be posting soon….just not every two weeks like I wanted) and music is sort of letting me down right now and I am not as inspired to write about any of the new music I have gotten. So…. Buttons – these are links I’ll post. Fun links or new obsessions. Blessed Be – I just feel that the Pagan stuff doesn’t fall under the Butterflies category too well and I want to write more about it and the more I write about it the less I feel it belongs with nature-y stuff. So I’m splitting it up a little and Butterflies will be only about butterflies and nature-y stuff. Posted on July 31, 2009 by Shana N.
* I GOT A JOB!!! I start Monday and I couldn’t be happier. An administrative assistant for the IT department. Working with geeks….I shall do very well in this position! 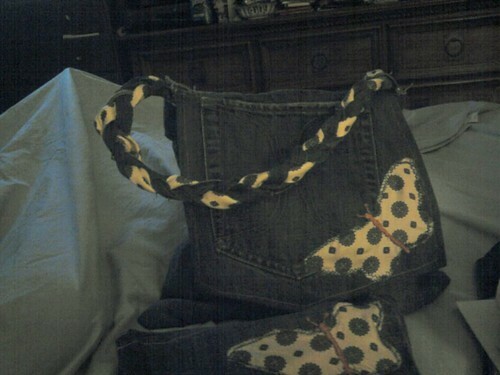 *I have been working at improving my crafting skills and sewed the above purse and make up bag out of a pair of old jeans and a tie. I am a proud little crafter and also proud of my recycling skills. I also saved my favorite jeans this week after the riveted button fell off (in a strange manner in which my jeans were being ripped off *shock*) and I found some old vintage buttons to replace the closure and also the the back pockets (which one had also come off….cheap rivets or something!) and it made the jeans super cute! Reuse, Reduce and Recycle in full effect baby! * I found a perfume that smells exactly like Aveda yummy products. You can smell wonderful in an essential oil all day long! Violet in 5 Points has the entire mini line of rollerball essential oils and you can pick your own scent. Read more about the Tsi-la organics. * This weekend is the SummerTime in the City annual celebration of Hip Hop! Go to the site to find out who to see and where to go! We plan on spending Saturday bouncing from site to site ending up at Shantytown in the end! I can’t wait! LEAK AT WILL a chance for Atmosphere to thank their fans. They are amazing, take a listen if you don’t know. Urban Jacksonville #9 a mixtape collaboration by UJ & Thought &Theory is worth a listen. There you go, 3 free dope soundtracks to get you through the summer. Don’t say I never give you anything! Lol! *The last little bit of happy is just me being so in love with my husband. He supported me over the 3 months that it has taken me to find a new job. It is stressful to switch to one income and he handled it with class and love. He kept my spirit up when it was a little crushed and that is everything and more that was needed.